How spiritually dangerous is it to be using only the KJV? Does it simply hinder your ability to understand Scripture (which is more than enough reason to avoid it at all costs), or does it actually get worse? Believe it or not, it gets MUCH worse! 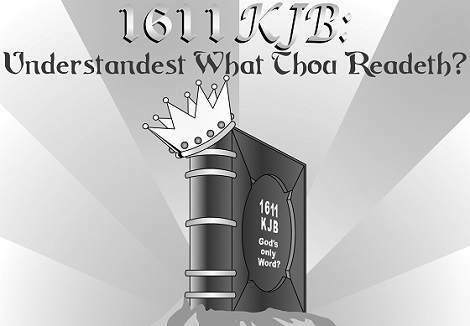 Is The 1611 King James Bible God’s Only Word? Great flash cartoon refuting this erroneous belief. Dan Corner is a true holiness preacher. Click for some soul stirring holiness preaching. The Immaculate Conception is a theological term, which was created to described the fictitious and mythical Mary of Catholicism. The immaculate conception does not refer to Jesus being born of a virgin as many have been misled to think. Instead, it centers around the exalted Catholic Mary and her remaining sinless! Somehow, many non-Catholics have been duped about that non-Christian concept which has helped to spread an unscriptural unity with Catholicism. Click here to read more information about the immaculate conception. Remember: Jesus was born of a virgin, but the immaculate conception of Mary is about Mary (not Jesus) and is very misleading.